Well, it is the first day of Spring. I welcome the warmer season. I love snow and I love the cold, but for some reason this year I am really looking forward to the warmer weather. It may be the students, it may be me, I’m not sure; but I’m ready for it. This morning I am sitting on a train somewhere in Illinois. This is my first train ride ever, and all I can say, is that I will probably begin to travel this way more. I’m on my way to Chicago for my Spring Break; which started on Friday afternoon. I’m with a few friends, they are all asleep, so I’m writing. First, I have to thank my Galaxy Tab for providing me with internet this morning. Next, I have need to recognize that many of you may be reading this looking for a math problem. It will be at the end. So you can either bare with me and read my entire post, or just skip to the end. With this being my first train ride, I wanted to share my experience. As many of you know, I love to share what I do. First, we drove to St. Louis, Missouri from Emporia, Kansas on Saturday. It took about six hours to do so. Now, we could have caught the train in Kansas City, Missouri, a 1.5 hour drive, but I’m not driving, so no one listened to me. I’m not going to bore you with the details of the drive nor the stay in St. Louis, for it was just over night. Instead, ALL ABOARD!!! The train that we got left at 4:35 Sunday morning. We were up pretty late on Saturday, so 2:30 came early. We got to St. Louis Gateway Station around 3:30 am. (on a side note, I’m sitting on the cafe car and I’m watching people ‘stumble’ their way to get coffee) We went and checked in, receiving our tickets. We were not checking our bags, all were carry ons. Which means I am taking my computer bag, suitcase, bag, and hanging bag on with me. What can I say, it’s a week-long trip and I don’t know what I’m going to wear. We got on while it was dark. Yes, I know that you realize this, but think about it. When it’s dark outside and the lights are on inside, you can’t really see out. That was very disappointing to me. I was wanting to see the sights as we rode along the rails. So I started to read my Google Reader and play games on my Tab. Well, after about an hour I couldn’t keep my eyes open anymore. So I closed my eyes and took a little nap. Now the seats on a train are a little larger than planes, and there is more leg room. For someone who is 6’3″ and travelling with three friends that are all over six foot. . . .”SCORE!” We were able to stretch out a little more than when we were crammed in the car or even on a plane. After a little hour nap, I was hungry. Now, since I’ve never been on a train, I didn’t know where to go nor what to do. (Be right back, I need my last cup of coffee before the cafe car closes) (alright, I’m back. What? Were you expecting to see words typed in between getting up and coming back?) Well, I saw a lady with a coffee cup walk by. I asked her where she got the coffee. So here I was, walking off to the next car over to get my coffee. I decided to have a hot bagel with cream cheese as well. It was very delicious. So, here I sit, next to be people waiting for food after the final call. I’m enjoying the atmosphere and the chance to people watch. I love being able to just sit back and enjoy the scenery. However, this is the first time I have seen the sights around me change as I people watch. I normally sit inside a coffee house and watch people move about their day. I encourage everyone to take a train ride somewhere. They are relaxing and let’s face it, environmentally friendly. Now, here is the math problem you all have been waiting for! We drove from Kansas City, Missouri to St. Louis, Missouri. The trip is 250 miles long. A tire on the car is two feet in diameter. (I know that there are four tires, all of which the same size, but I’m trying to make the problem a little less confusing.) How many rotations did the tire make on the trip? Well, we’re just about to Joliet, Illinois, which means my time in Chicago will begin soon. I’m excited about all the first experiences that I will have. Have a great Sunday, everyone! ** The photo above was taken by me at a Schnucks store in St. Louis, Missouri. 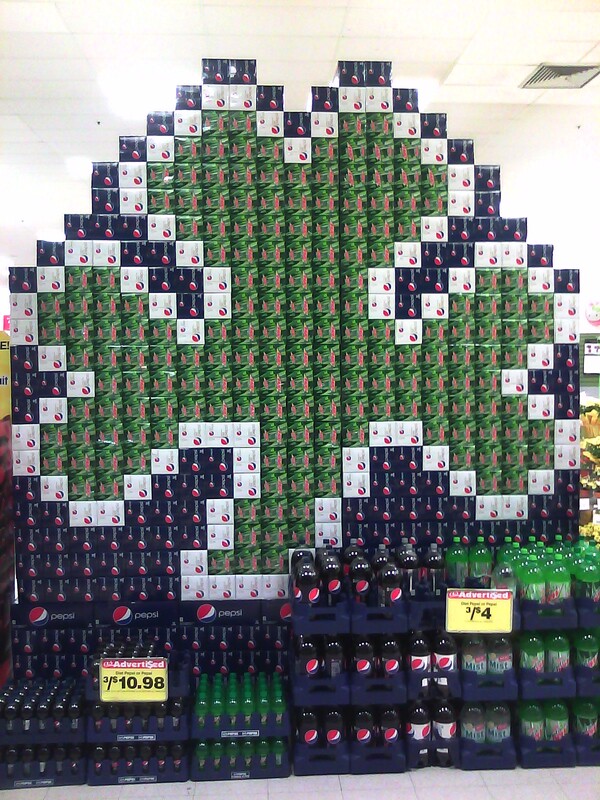 It is made up of Pepsi products. This entry was posted in Android, Blogging, Breaks, Education, Geography, Math, Train, Vacation. Bookmark the permalink.